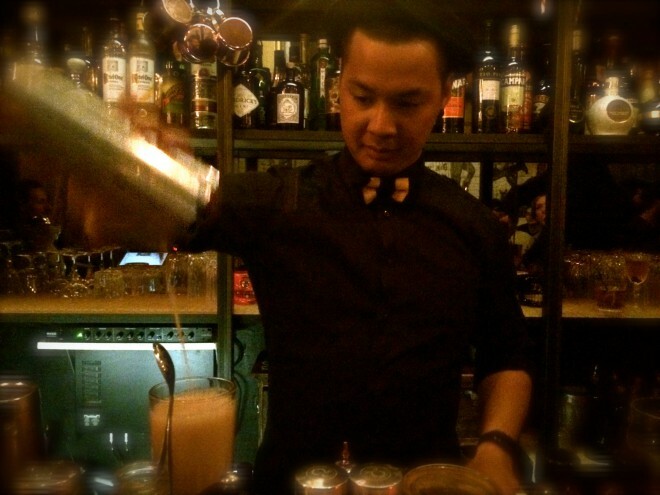 Christophe is bar manager at Le Calbar in Paris. He makes for us two cocktails, the first one with gin and Noilly Prat and the second one with Nikka whisky and infused vodka with chrysanthemum. Hi I’m Christophe and I am one of the founders of Le Calbar in Paris. I discovered the world of bartending 5 years ago, before that I was a chef. I left the kitchen to manage a team in the restaurant and that’s where I discovered the bar. Right away I knew it was for me. It’s the mix of what I like in the kitchen, concoctions and presentation, but with the client relationship that I missed. And of course cocktails because it’s about the mixing of flavors, the garnishes and all the products you can prepare with spices, syrups and infusions… there is no limit. As this is my bar, this is my dream. I love all kind of bars and drinks… sometimes a mojito, sometimes a stirred one. It’s more about who I am with and my mood. It’s like restaurant, one day it could be a burger craving, another other day I’ll be fancy with real well prepared dishes. It’s more about a mindset than the place. I love whisky for its complexity. It can be round, sweet, dry, smoky. You learn about it everyday, you can taste a new one everyday, there is no end to it. There’s always a new bottle, it’s incredible. A good cocktail is about the right balance, but at the end it should match with the person who orders it. For instance there are only 3 ingredients in a daiquiri, but no one will drink it the same way, some prefer more acidic, others more sweet. So the bartenders have to chat with the clients to understand what they are expecting, even if there are some clues. Here for instance, the audience is mainly female, so most of the cocktails are red fruits based and sweet. More girly, even there is no rules, but meeting a girl who orders a peaty whisky neat is far less common. I love to work with homemade syrups, even if it’s not for all the cocktails. When you go to the market or in Chinatown, you always find new stuff that you can prepare in syrups. So it’s a good way to make people discover new flavours. Where do you think we need to go to interview another bartender? Go to meet Sulli at Le syndicat or Mido at Café moderne, a place to learn a lot of stuff, I always feel chilled there.